ESTERO, FL -- Florida Everblades President and General Manager Craig Brush along with Head Coach Brad Ralph announced Wednesday that the team has agreed to terms with defenseman Matt Mackenzie for the 2016-17 season. (Above Photo courtesy of Rich Tilton). Mackenzie, 24, joins the Everblades after posting 20 points (2g, 18a), 102 penalty minutes, and a plus-21 rating in 53 games played last season with the Manchester Monarchs (ECHL). 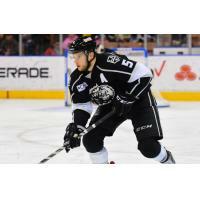 Mackenzie also logged three points (2g, 1a) with a plus-10 rating in 19 appearances with the Portland Pirates of the American Hockey League (AHL). "Matt is an experienced defenseman that brings leadership and heart to our lineup," said Ralph. "Matt is very mobile and will make an impact for us at both ends of the ice." From 2011-2015, the 6-2, 190-pound blueliner totaled 24 points in 177 games played with the Rochester Americans (AHL). Mackenzie also has ECHL stints with the Atlanta Gladiators (2011-12), Greenville Road Warriors (2012-13) and the Elmira Jackals (2014-15). Mackenzie had four productive seasons during his major junior career in the WHL with the Calgary Hitmen and Tri-City Americans from (2007-2011) totaling 98 career points along with 180 penalty minutes. The New Westminster, BC native was selected by Buffalo Sabres in the third-round of the 2010 NHL Entry Draft. Opening Weekend is October 14 & 15 The Florida Everblades open up their 19^th season of hockey at home at Germain Arena on Friday, October 14 against the Greenville Swamp Rabbits beginning at 7:30 p.m. The first 5,000 fans will receive a free Everblades magnet schedule courtesy of Jack's Cleaning. The two teams will meet again on Saturday, October 15 with a 7:00 p.m. start time. 2016-17 Season Ticket Plans Now Available! Full and flexible partial season ticket plans are currently available for the 2016-17 season. We offer several tickets packages designed to help fit your budget and schedule. Special Offer! Purchase any new ticket package for the 2016-17 season, and receive a $20 gift card from ** Ford's Garage! (http://fordsgarageusa.com/) Locations include Cape Coral, Downtown Fort Myers and Miromar Outlets in Estero. For more information, call 239-948-7825, or stop by the team's main office located at Germain Arena from Monday through Friday 9:00 a.m. to 5:00 p.m.